BMW has received hundreds of advanced orders for the new i3, currently a concept, but slated for production. BMW has arrived late to the electric vehicle party, but the new i3 Concept is moving towards production. The i3 is not an electrified version of the BMW 3 Series, but rather a unique chassis with unique running gear. BMW designed the i3 as an urban mobility vehicle. Unlike some other manufacturers BMW has resisted the urge to quickly create and sell an EV that will try to compete head to head with liquid fueled cars. Speaking from Munich, Norbert Reithofer, Chairman of the Board of Management of BMW AG pointed to the new i3 as an important part of the company’s growth strategy and forecast for 2013, which remains bullish. Reithofer said "The future belongs to those who dare to venture. Several hundred advance orders have already been received for the BMW i3.” Advanced orders are a cornerstone of the EV marketing strategy. Nissan’s Leaf, the Chevy Volt, and the Tesla Model S all used pre-orders to both gauge interest and to provide enthusiasm for the vehicle. Although pre-production i3s have already been built, the production model is not slated for sale or lease to the public until later this year. The i3 will join the Leaf, Chevy Spark, Honda Fit, Tesla Model S, as well as models from Ford and other manufacturers when it debuts in late 2103. It will also find competition from the extended range EVs such as the Chevy Volt, Cadillac’s version of the Volt, and even plug-in hybrids from Toyota, Honda, and Ford among others. The i3’s urban transportation marketing model may serve it well. 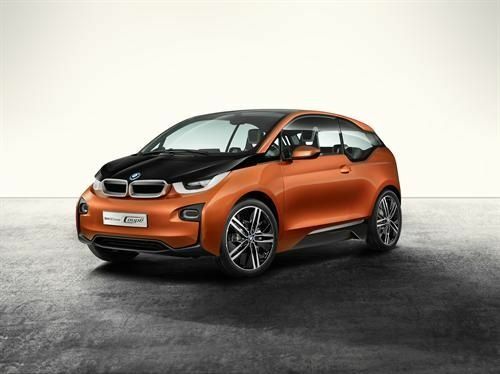 In order to offer a boost to the short range of the i3, estimated at about 75 to 80 miles, BMW has thought outside the box. The company has considered both an on-board range extender and even opened up the possibility that an i3 owner may want to borrow a liquid fueled BMW for trips that the i3 isn’t suited for. BMW considers Evs a must for “megacities.” In his comments Reithofer points out that in China Evs don’t have to wait for a plate or go through the red tape associated with a liquid fueled vehicle if they will be operated in Beijing. In its press release BMW highlighted the i3s aluminum frame and carbon fiber body panels as key elements to its low weight, which will come in about 400 pounds less than a typical electric vehicle its size, though it will still be heavier than a small diesel car made from steel stampings. Ease of construction is also a hallmark of the i3 and BMW expects to be able to manufacture it in half the time of a typical small car. The i3 will be on sale or available for lease by year’s end. BMW has not yet announced firm pricing.